When a troll calls you a “n*gger”, in response to your public work that addresses racial injustice (i.e., a book you have published, a lecture you have given, a piece of art you have painted, a podcast you have given, etc), what is your somatic response? “Intellectually”, I know they are there to be trolls and to incite terror and I am not “supposed” to let it “bother” or “get to me”… but that’s just brainy Breeze saying this… My body isn’t convinced and often, I feel and experience what could be symptoms of racial battle fatigue and trauma (deep trauma from my ancestors who were enslaved, lynched, and knew that “n*gger” isn’t just a word, but an action, a system of thought, a philosophy, and act of terror on Black bodies). Do you deal with the somatic and convincing yourself that racial epithets are “just words”? 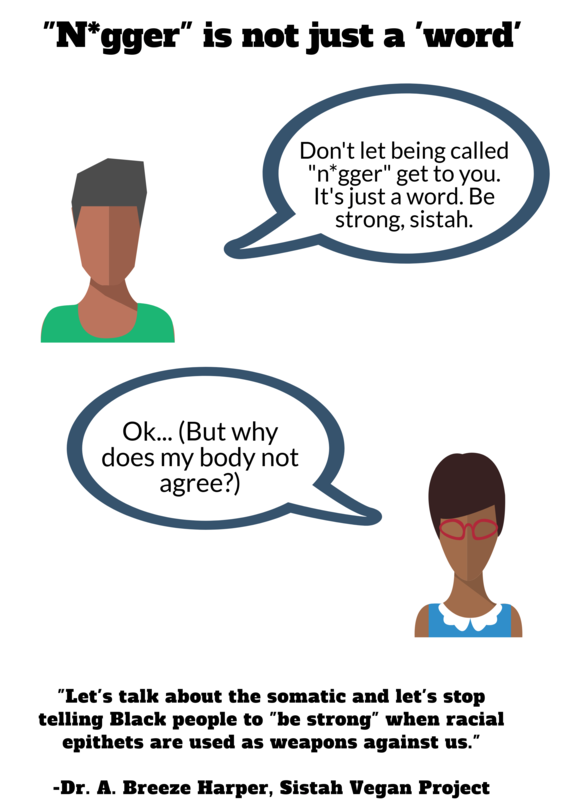 Because I am realizing more and more that that brainy critical race feminist Breeze thinks she is able to just let it bounce off of her, but I know it isn’t just that easy and her body lets her know through nightmares, anxiety, and knowing that she is not as “safe” as she thinks she is. Dear Black folk who mean well: Let’s talk about the somatic and let’s stop telling Black people to “be strong” when racial epithets are used as weapons against us. I know many Black folk have tried to help me by telling me to stay strong and don’t let it get to me… but like I said above, my body isn’t having it. If you feel this way but have been afraid to talk about it, I understand. This morning, I got a pop up notification from YouTube. Someone commented on my Uprooting White Fragility in the Ethical Consumption movement video I had posted. Their only comment? “N*ggers” is what they wrote. And today, I couldn’t be brainy rationale Breeze about it, or convince myself that “it’s just a word and racist trolling.” Today it f*cking hurt and it made me physically sick. Although I only qualify as a “dirty Italian,” I agree completely. As a philosopher, I understand that our instinct is just as important as any argument we might build. My issue, if I have one, is even saying “Black people” when what I intend is black friends, that is, friends whose skin is remarkably and beautifully darker than mine, and that alone. I ache for the days of my childhood, when it did seem all that simple. For the days when so many shared The Dream, Martin’s dream.